The gospel method of sanctification, as well as of justification, lies so far out of the ken of natural reason, that if all the rationalists in the world, philosophers and divines, had consulted together to lay down a plan for repairing the lost image of God in man, they had never hit upon that which the divine wisdom has pitched upon, viz: that sinners should be sanctified in Christ Jesus, (1 Cor 1:2), by faith in him, (Acts 26:18); nay, being laid before them, they would have rejected it with disdain, as foolishness, (1 Cor 1:23). The Jews, in the time of Julian the Apostate, attempted to rebuild their temple, after it had lain many years in ruins, by the decree of heaven never to be built again; and ceased not, till by an earthquake, which shook the old foundation and turned all down to the ground, they were forced to forbear, as Socrates the historian tells us. But the Jews were never more addicted to that temple, than mankind naturally is to the building on the first covenant: and Adam's children will by no means quit it, until Mount Sinai, where they desire to work what they do work, be all on a fire about them. Oh, that those who have been frightened from it were not so ready to go back towards it! Howbeit, that can never be the channel of sanctification, whatsoever way men prepare it and fit it out for that purpose, because it is not, by divine appointment, the "ministration of righteousness and life," (2 Cor 3). And hence it is always to be observed, that as the doctrine of the gospel is corrupted, to introduce a more rational sort of religion, the flood of looseness and licentiousness swells proportionably; insomuch that morality, brought in for doctrine, in room and stead of the gospel of the grace of God, never fails to be, in effect, a signal for an inundation of immorality in practice. A plain instance hereof is to be seen in the grand apostasy from the truth and holiness of the gospel, as exemplified in Popery. And on the other hand, real and thorough reformation in churches is always the effect of gospel light, breaking forth again, from under the cloud which had gone over it; and hereof the Church of Scotland, among others, has, oftener than once, had comfortable experience. The real friends of true holiness, then, do exceedingly mistake their measures, in affording a handle, on any occasion whatsoever, for advancing the principles of legalism, for bringing under contempt the good old way in which our fathers found rest to their souls, and for removing the ancient landmarks which they set. It is now above fourscore years since this book made its first entrance into the world, under the title of The Marrow of Modern Divinity, at that time not unfitly prefixed to it; but it is too evident it has outlived the fitness of that title. 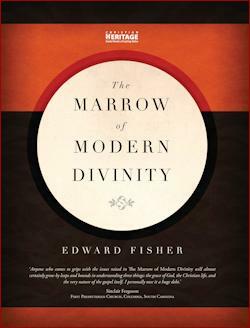 The truth is, the divinity therein taught is now no longer the modern, but the ancient divinity, as it was recovered from underneath the Antichristian darkness; and as it stood before the tools of the late refiners on the Protestant doctrine were lifted up upon ita doctrine which, being from God, must needs be according to godliness. It was to contribute towards the preserving of this doctrine, and the withstanding of its being run down, under the odious name of Antinomianism, in the disadvantageous situation it has in this book, whose undeserved lot it is to be everywhere spoken against, that the following notes were written. And herein two things chiefly have had weight: one is, lest that doctrine, being put into such an ill name, should become the object of the settled aversion of sober persons, and they be thereby betrayed into legalism. The other is, lest in these days of God's indignation so much appearing in spiritual judgments, some taking up the principles of it, from the hand of this author and ancient divines, for truths, should take the sense, scope, and design of them, from (now) common fame; and so be betrayed unto real Antinomianism. Reader, lay aside prejudices,look and see with thine own eyes,call things by their own names, and do not reckon Anti-Baxterianism or Anti-Neonomianism to be Antinomianism, and thou shalt find no Antinomianism taught here; but thou wilt be perhaps surprised to find, that the tale is told of Luther and other famous Protestant divines, under the borrowed name of the despised Mr. Fisher, author of The Marrow of Modern Divinity. In the Notes, obsolete or ambiguous words, phrases, and things are explained; truth cleared, confirmed, and vindicated; the annotator making no scruple of declaring his dissent from the author, where he saw just ground for it. I make no question but he will be thought by some to have constructed too favourably of several passages; but, as it is nothing strange that he inclines to the charitable side, the book having been many years ago blessed of God to his own soul; so, if he has erred on that side, it is the safest of the two for thee and me, judging of the words of another man, whose intention, I believe, with Mr. Burroughs, to have been very sincere for God and the reader's good. However, I am satisfied he has dealt candidly in that matter, according to his light. Be advised always to read over a lesser section of the book, before reading any of the notes thereupon, that you may have the more clear understanding of the whole. Memoirs of Mr. Halyburton's Life, page 199.